No Limit Monsters! 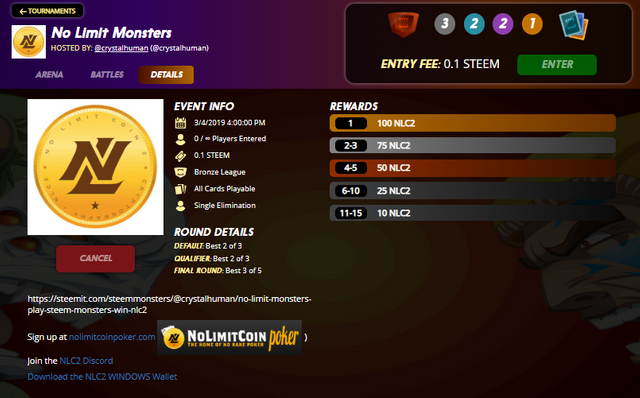 Play Steem Monsters, Win NLC2! Join for your chance to win up to 100 NLC2! Sign up for Steem Monsters! Thank you! I hope it does too :D Good luck! Thanks for the refund, I was looking forward to your tournament😒💁I guess most people want to win steem to buy more cards or whatever , coins have such a reputation of crashing that people dont trust or want what they dont know. You might want to do some free to enter tournaments just to get people to know more about it and try it out! Yeah hopefully I can figure out a way to get people to join..
You just got a 10.43% upvote from SteemPlus!